This screen can be used to quickly calculate a sight intercept or double-check your manual sight reduction. Enter all values for a particular sight, then tap on the Calculate Intercept button to perform the sight reduction. Notice how on Android contextual help is always a click away (by tapping on the Help button at the top right of the screen). This screen presents the results of the sight reduction. 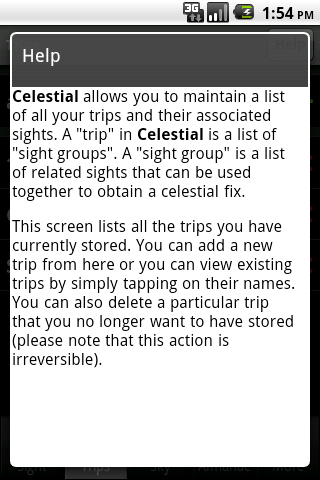 Celestial includes a trip manager that allows you to manage all your sights in a trip and to store multiple trips that can be revisited at any time. 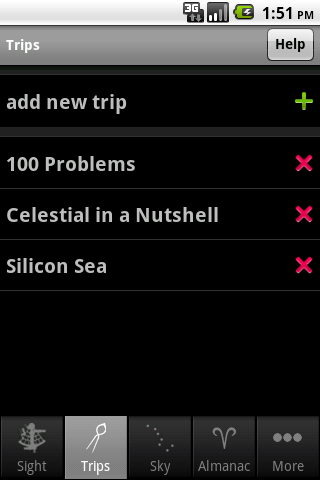 This screen currently lists three different trips. We will drill into one of these trips to learn how trips are organized. Trips are organized into "sight groups", which are groups of sights that can be used together to arrive at a celestial fix. This screen lists 3 different sight groups. 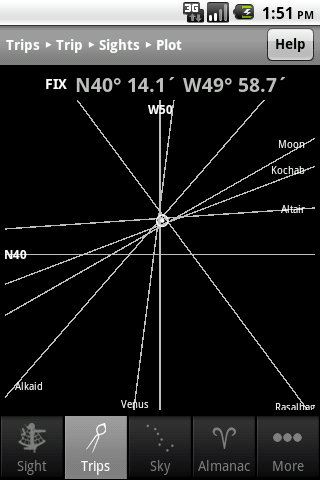 Because this is a fictional trip taken from the book "100 Problems in Celestial Navigation" the sights in the groups are taken from problems in the book. 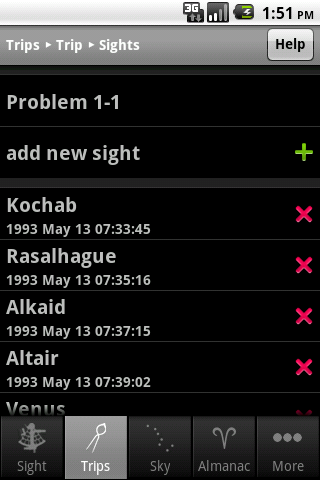 This screen shows you a list of all sights in the group named "Problem 1-1". Sights are entered using a screen similar to the one shown earlier. Tapping on the Plot button, will calculate a fix and will plot it in a virtual plotting sheet. This screen shows the plot of the previous sight group. 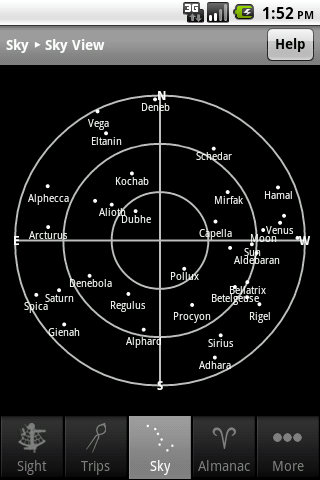 Celestial can calculate the positions of the Sun, Moon, planets and navigational stars and present this information in a manner that assists in sight planning. 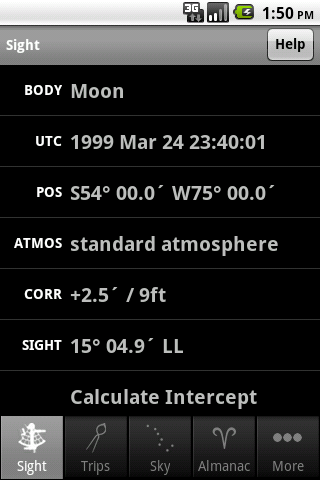 Enter your position and date/time and tap on Sky View to see a view of the sky. 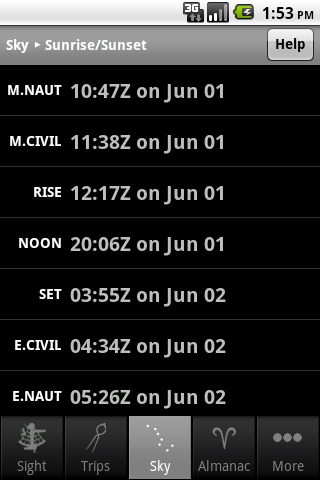 Or tap on Sunrise/Sunset to see the times of these phenomena. 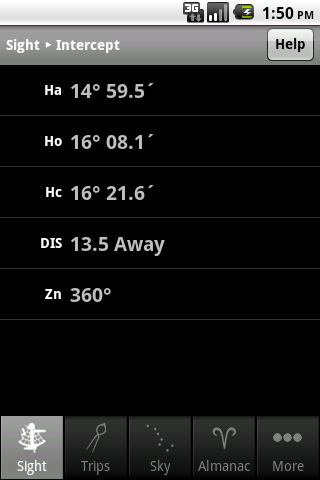 This screen shows the Sky View (virtual Star Finder). Tapping on a particular star will reveal its positional information. For example, here is positional information about the stars that were tapped. 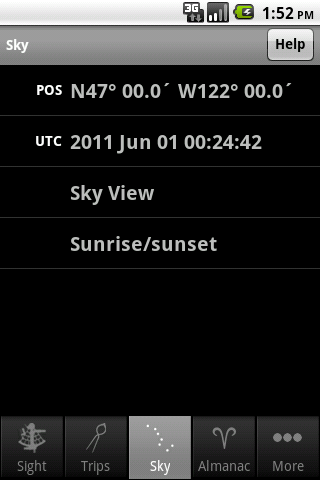 This screen shows the times of the sunrise/sunset and associated twilight phenomena. Celestial includes a full Almanac for the Sun, Moon, planets and navigational stars for the years 1980-2099. 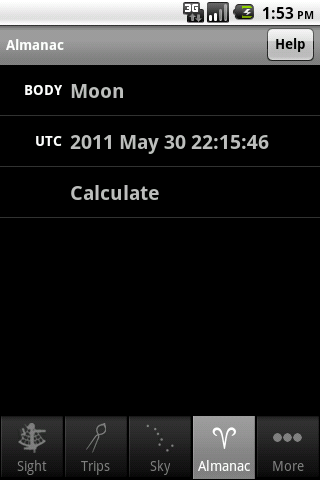 In this screen you can choose the desired celestial body and date/time and then tap on Calculate for almanac information. 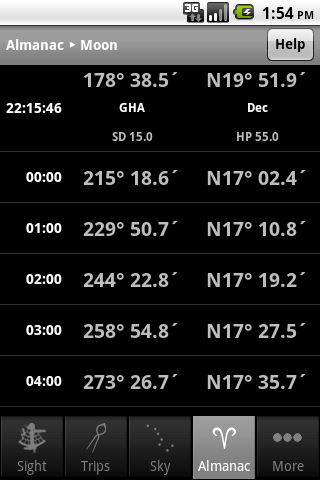 This screen presents detailed positional information for the chosen celestial body and date/time. In additional positional information for the 24 hours of the day is also presented (similar to the Nautical Almanac). 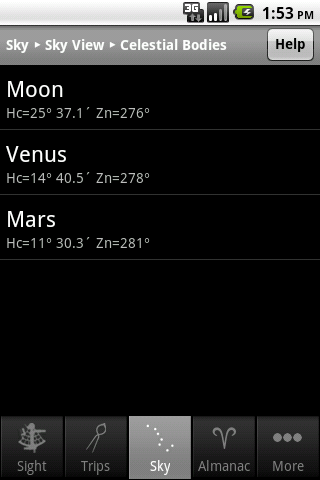 As mentioned Celestial includes contextual help for all screens. For example, here is the help screen for the first Trips screen.